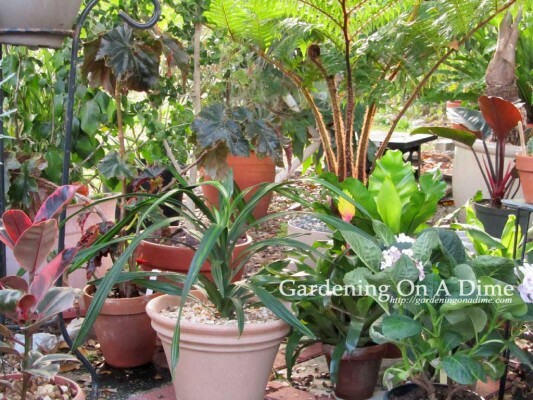 Can spending time in a garden give you a feeling of happiness? I saw this quote shortly after we visited with some friends. Friends who are also gardeners. Gardeners who are state fair winning gardeners. Best of show, best of division sort of folks. Sitting for a while in any of their garden rooms is always treat. On this visit, we sat on a wooden swing, happy as could be, swinging away. So far……..garden equals happiness. Swinging away, enjoying the view. Everywhere we looked, there were dozens of varieties of plants. Variety…up the happiness level a notch. Seeing fully grown specimens gave me hope for our smaller plants. Now we’re smiling. Many of the flowers and plant in this garden were planted in unique and cool containers. Nice hair! A bit of glamour in the garden? 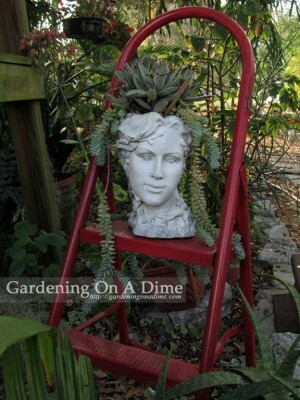 Being “Gardening On A Dime” type folks, like us, they reuse and re-purpose objects into great yard art. 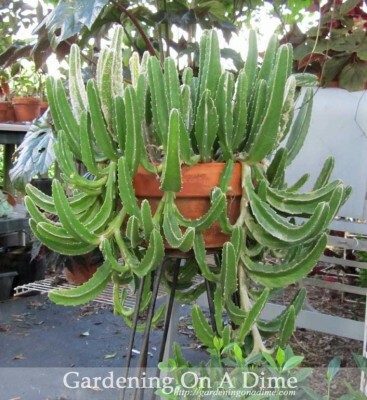 They have objects in the garden that are just plain cool ideas. I particularly like the bowling balls as orbs. I was told that ” they don’t break like those glass ones.” I know that fear. 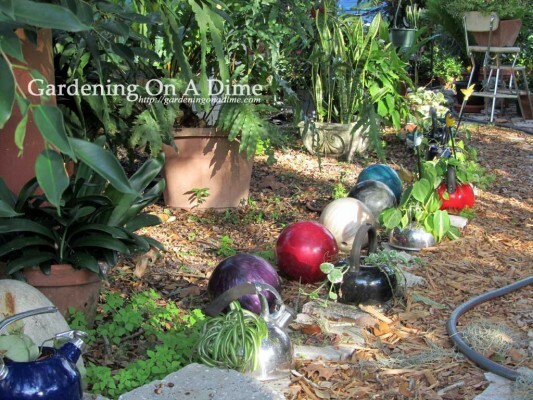 Garden path lined with bowling ball orbs. 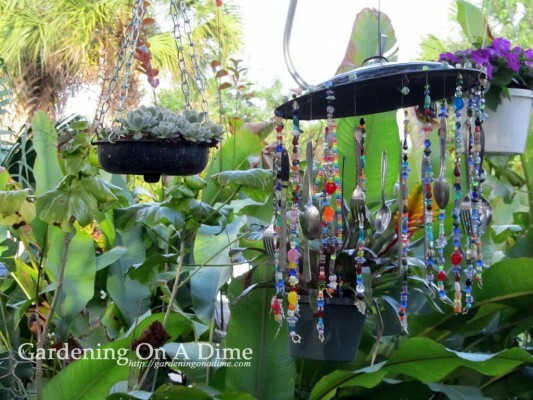 And, I don’t know if this has a name, so I’ll call it a beaded sterling wind chime. Our friends have put together colors, fragrances and textures, using plants and objects to create wonderful garden rooms. And the truth to today’s quote can be felt. “He who plants a garden plants happiness”. The variety of conversations that we enjoyed during yesterday’s visit always came back to the subject of gardening, plants, and objects to use as yard art. Also noticeable was the sensation of contentment and happiness. It could be felt just by sitting, swinging, and talking with friends. It doesn’t matter if you prefer formal gardens or whimsical gardens like our friends, ask yourself this question. What happiness factor does your garden bring to you and your friends? Just happened on this while on facebook, imagine my surprise when I discovered this is my brothers garden. 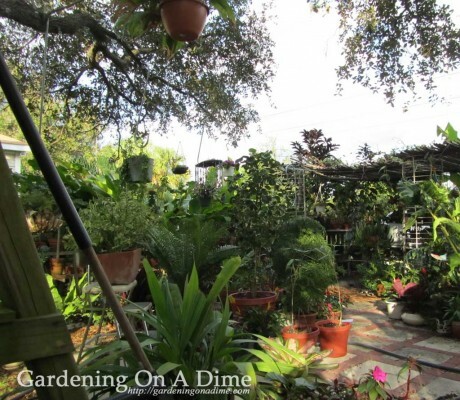 He has a great eye for putting a garden together of unusal varieties of plants not to mention the green thumbs on both hands. He inherited his gardening gene from our Mom, we use to say she could plant a steel rod and it would grow, same is true of Rusty. My sister and I try but we don:t come close. I love going to his Garden it is ever changing as a garden should be. So glad you found this! If there was ever a man that could be called a real gardener, it’s Rusty! He definitely has the eye for design. Sharing what I grow with friends is one of the greatest joys for me as a Gardener! Your sharing philosophy spills over in our lives more than just gardening, my friend. Thanks again for the cool collection of new plants.